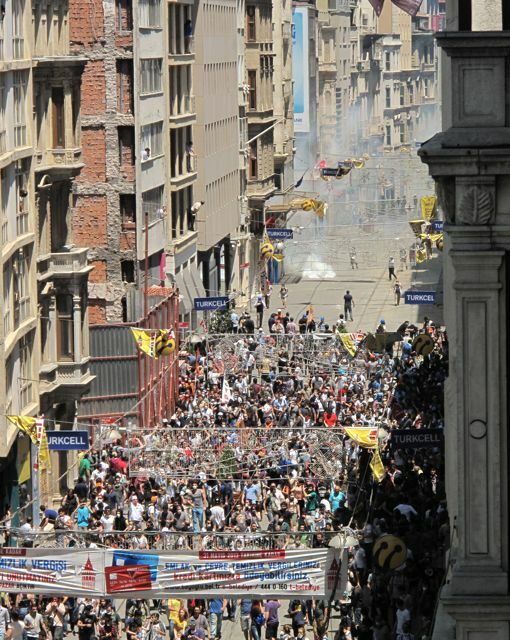 Living right on Istanbul’s main pedestrian boulevard of Istiklal St, 1km south of central Taksim Square and the now legendary Gezi Park, has given me a ringside seat to the wave of unrest that has gripped the city over the past 48 hours. At times everything seemed normal, even if the passers-by were fewer than on a usual weekend. Until late last night the music shop opposite was still churning out its usual Istiklal St. dirges. Then a group of protestors entered stage right, retreating from Taksim (slogans included: “We are the soldiers of Mustafa Kemal [Ataturk]”, “You’re all sons of whores”, “Government Resign”, “Shoulder to shoulder against fascism”…), the first of several waves usually pursued with a strange theatricality by a group of police with an ugly water cannon truck — water from its high pressure hose scattering people like the whip of an angry mythical beast – and a posse of riot squaders. A few explosive pops from the tear gas launchers, and gas would stream out of canisters where they landed, the smoke unfurling in ribbons down the street. At our third-floor height it usually only burns the eyes and nose. We closed the windows for a few minutes before opening them up again for a better look at the next wave of attack and counter-attack. Early this morning, all seemed quiet. Municipality cleaning trucks had left the pedestrian precinct immaculately clean, the vans that restock the Istiklal St. shops turned up, and middle-aged north American tourists wandered down in new white sneakers & their pink, plum, and orange cottons, taking in the sights. But there was an odd silence in the street that did not bode well for the day ahead. At 10am, a first group of protestors came running down the street, chased by another police patrol spraying water left and right, popping off gas canisters and chasing demonstrators into side-streets. One group who took refuge in a shop got a special, almost casual gassing by passing police. At 10:30am, small groups of demonstrators gathered again. One came from the south, built a barricade outside our building to try to stop the police vehicles chasing them, and then headed off for Taksim. Throughout this, the seller of Turkish simit sesame bagels from a little red nostalgic ‘Beyoglu’ cart remained firmly at his post – doing steady business just meters from where the skeins of gas fumes were floating around. But even he fled at 1:15pm, when the police charged more strongly and fired a dozen gas canisters, some aimed high and sent spinning down this late 19th century boulevard like javelins on a battlefield. Everyone scattered into sidestreets. (My wife Jessica Lutz filmed it, here). Ten minutes later, they were back with even more people filling the pedestrian district, with even more scornful slogans about “Killer AKP” (the ruling party). At 2pm, the police counter-attacked, even more dramatically. The crowd regrouped, its slogans turning into low howls of anger; at 2.45pm the police pushed back again from behind a thick screen of gas. This time they also faced a barrage of stones from some protestors, among the very front lines of which could be seen the red flag of the Turkish Communist Party and even a lone flag of the Kurdistan Workers Party (PKK). 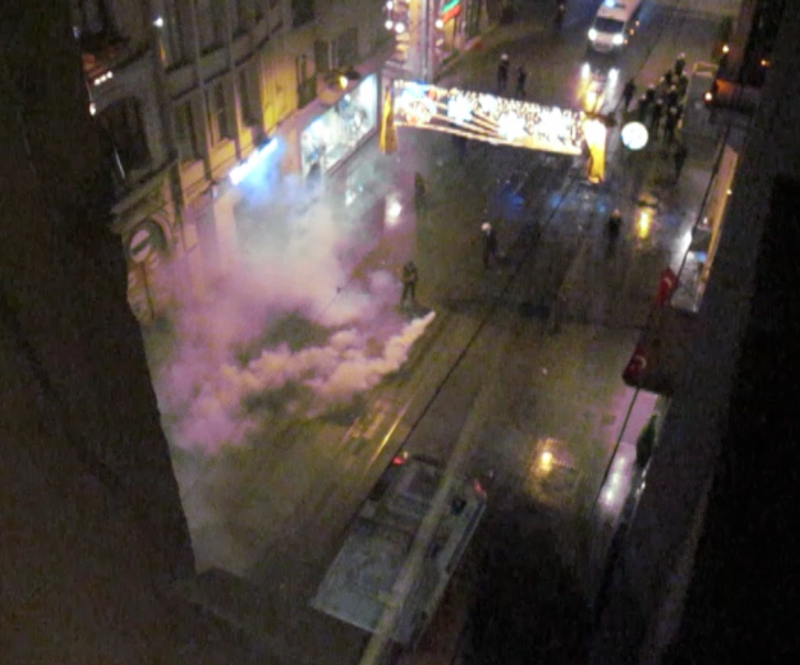 At 4pm, after a last flurry of gas canisters near Galatasaray, the police reportedly received orders to allow demonstrators through to Taksim. Gradually the crowd – mostly cheerful, ordinary folk with no obvious political affiliation who filled the breadth and length of Istiklal St’s southern half – moved forward to Istanbul’s central square in celebratory mood. So what’s new in all this? Social media, for a start. Many of my Turkish friends are glued to their Facebook accounts, sharing pictures of the worst police outrages – a remarkable one shows a policeman dousing a protestor with a device like an insect spray gun, as the protestor holds up a sign saying “Chemical Tayyip” [Erdogan] — and spoof posters like an ad for the “Istanbul Gas Festival”, “We can’t keep calm, we’re Turkish” and so on. The spontaneous look of the small groups of protestors coalescing and dispersing in the street outside is quite unlike the usual formal protests organized by unions and political parties, and lacks the angry, violent edge to the pop-up parades by radical left-wing groups. Mostly young and middle class, they include people in shirts for all Istanbul’s big rival football clubs, young women in headscarves, groups of white-coated medical volunteers, and a young man with a big bag of lemons, selling them to the crowd as an tear gas antidote. On the other hand, Turkey had the same banging of pots and pans in anti-government neighbourhoods in the 1990s, which was widespread on the Asian side of Istanbul last night; and in my district of Beyoglu, every year or two a big issue brings angry demonstrators and policemen with gas weaponry that is used to clear people away. While the government is clearly rattled this time round, after four days, perhaps the only obvious long-term political consequence I can predict so far is that all this will be remembered when Prime Minister Erdogan launches his expected quest for the presidency in an election next year. The demonstrations are already about a lot more than sympathy for condemned trees in a street-widening scheme at the Gezi Park, and have taken on a distinctly anti-government tone. Reasons for the protests I’ve heard from friends over the past 48 hours include: a reaction to the ruling party’s focus on building shopping centers everywhere, even in Istanbul’s last patches of green, like the future mall planned for Gezi Park; how the half of the population that didn’t vote for the government resents what it sees as its increasingly high-handed, majoritarian, we-know-best style; among secularists, a sense that the ruling party revealed a Islamist agenda that could infringe its lifestyle with sudden new regulations this month on alcohol consumption (my blog on that here); among the 10 per cent Alevi minority, anger at this month’s choice of Ottoman Sultan Selim the Grim’s name for a third bridge over the Bosphorus, since he killed many Alevis; the general feeling that there is little transparency in what the government plans and does, and that the media is under great pressure not to discuss real events or who benefits financially from projects (one mainstream TV program during last night’s was about radiation on Mars! ); and above all, a sense of powerlessness, and frustration at the inadequacy of the main political opposition parties, which have left the bulk of secularists of Istanbul with a feeling that they’ve had no real political representation for years. There’s a lot of talk among my Turkish friends of the Gezi Park demonstrations being a “turning point”, and today it feels that way, with growing numbers of demonstrators in the streets, many cities in Turkey protesting in sympathy, and the unscripted nature of proceedings. Normal patterns have been drastically changed in recent days, not just in traffic but also in many peoples’ lives. Phone calls with friends in the center are often about “my street is all mixed up now, can’t talk for long”. If anyone gets killed, rather than 100 or so already injured, that will sharply escalate the situation. Here’s hoping the government manages to handle the next 24 hours more sensitively than the last. A good first move would be to get some traction by letting state television give a full version of events – currently, people are consuming a diet of wild rumors and partial views on social media, which can only add to the current escalation. ı hope if not anything prime minister will learn some humility from these protests. great article – thanks a lot. helps trying to understand from far away whats going on in Istanbul and concurs quit wide with the opinions of my turkish friend. do you see any signals of a strategy shift from the pm or other officals? Thank you. this gave me a clearer picture on what is happening there. very good post. thanks for the insight. Briliantly written Chris, we are probably getting more news on the UK news channels than on Turkish TV. Foreign office herehas now advised only necessary travel to Turkey – but then for most a holiday is a necessity! Nice Hugh. The whole thing seems planned to me. The demonstrastions were spontaneous, and innocent. As the police executed a dawn attack on the protestors camping in the park to drive them out. the picture had changed. The police has had quelched many a demonstration the same way before, their tactics are obvious to anyone by now. This time however, the nail they got accustemed to drive with the only means they have, their hammer, turned out to be titanium. Currently they are playing whack a mole all over Turkey and its only a matter of time the nails start biting back. 28 Mayıs – 2 Haziran 2013 “Taksim Gezi Parkı” Olayları Hakkında Dış Basında Çıkan Bazı Yazı ve Yorumlar | AK'nin Kişisel "İktisat Okuma Listesi"